In an attack code-named operation Gomorrah, which lasted for three days and three nights from July, 24 to July 26, British and American Planes dropped 350,000 incendiary bombs on the city of Hamburg. 15,000 people were killed and many more wounded. The city was destroyed. A terrible fire-storm raged in the aftermath and those who had survived the bombing and the burning, perished as it sucked the oxygen from the air. For days the city smouldered and smoke blotted out the July sun. 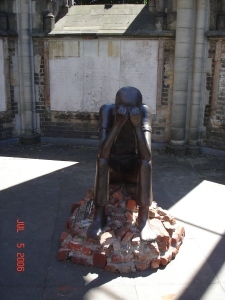 In the forecourt of Saint Nikolai, a stone figure sits slumped in grief on a pile of bricks. This statue commemorates the 50,000 people who lost their lives in the death camp at Sandborstel. The bricks came from the camp. St Nikolai’s Crypt has been restored and now hosts concerts, readings, and exhibitions. In Saint Nikolai’s Exhibition Hall displays of photos and films show the extent of the destruction wrought on Hamburg that July, in 1943. Photos, drawings, along with fragments of the altar, and stained-glass windows allow us a glimpse of the lost beauty of Saint Nikolai. There is no stronger caution to peace, no more poignant tribute to the victims of war, than the smoke stained skeleton of St Nikolai.